Principal contractor for the University’s Old Road Campus Project – Mace – has commended the joined-up approach adopted by client the University of Oxford and all construction partners involved. 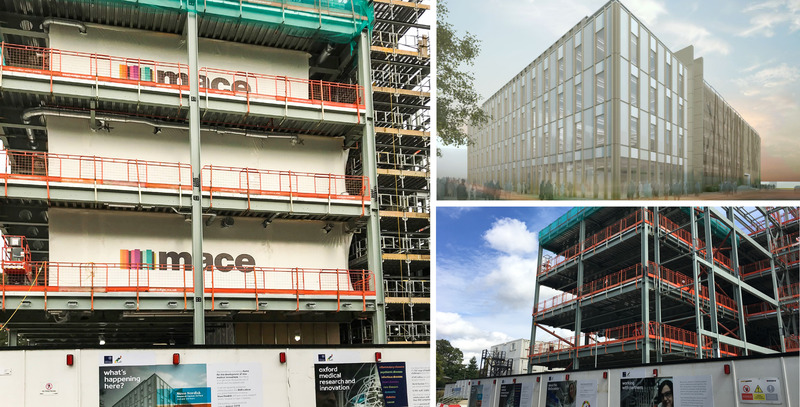 A hallmark of the Old Road Campus Project (ORC) was the highly successful collaborative working model involving Mace, the University of Oxford and the various tier-one construction partners engaged in the work. The Innovation Building involved the construction of research space for a pharmaceutical company and the BioEscalator based at the heart of the medical research campus adjacent to the Churchill Hospital, Old Road Campus, Oxford. This project follows Mace’s completion of the nearby Big Data Institute, with the team using the established site for this new project. The Big Data Institute opened in 2016 and is a purpose-built, state-of-the-art facility located in Headington, Oxford. Health, safety and site review meetings were regularly staged throughout the project to enable representatives from the various organisations and the University Capital Projects department to discuss all aspects of the work. “The purpose of the forum is to share lessons and best practice. We review any adverse events or incidents, implementation of best practice and have discussed diverse issues such as modern slavery, CLOCS, mental health and wellbeing, security, ‘buddy systems’, and soft landings. Some of the pertinent issues discussed during these forums were sustainable transport, adverse events and incidents, lessons learned and knowledge shared between contractors, traffic management, local authority events, and construction design and management (CDM). University security and terrorism issues were also on the agenda. A Mace guest speaker shared a presentation on risk management of LOLER (Lifting Operations and Lifting Equipment Regulations). The Mace presenter was joined by a representative from Pro-Lifting. Main contractors were invited to the forum, as well as University stakeholders such as Health and Safety, Insurance, Security Services and the Environmental Sustainability Manager. “I have worked for a number of high profile clients in my 22-year construction management career, both from the private and public sectors, but I have yet to come across a capital projects department quite like the team here at the University of Oxford, who facilitate and encourage cross-contractor knowledge sharing. “The meetings that the client facilitates between all contractors is proving very valuable in sharing best practice and provides a forum to discuss any issues or trends. The project team was praised for their innovative method of using Tufcoat wrap to provide an enhanced working environment, by enabling the workspace to be environmentally controlled for both first and second fix works. To view a time lapse video showing Mace using this innovative Tufcoat wrap, click on the following link.